Rather than working on a hypothetical website (then trying to find the time to apply what you’ve learnt) you will work on your own website from day one, because you learn best by doing. Our workshops are hands-on and interactive and we personally get to know each student before every workshop so we can tailor the content to suit them. We provide in-depth workshop materials that cater to different learning styles. It is our aim to make sure you feel totally at home from the minute you arrive. You’ll learn, and understand what is required to design, build and maintain your website and one that is user-friendly, fast, tablet and mobile ready. You’ll learn what is required to ensure your site is compliant with Google – non-compliance can lead to your website being moved to page 10 for example. You will gain access to our library of pre-designed website pages that are beautifully designed and optimised for all devices (desktop, tablet and mobile). All pages can be customised to suit your branding and business needs. You can change the fonts, colours, upload your logo, replace images and add pages with ease. The library of layouts include pre-designed pages like: Home, About, Services, Contact, Maps, Menus, FAQ’s,Pricing Tables and so much more. There will be no more long stares at a white screen. 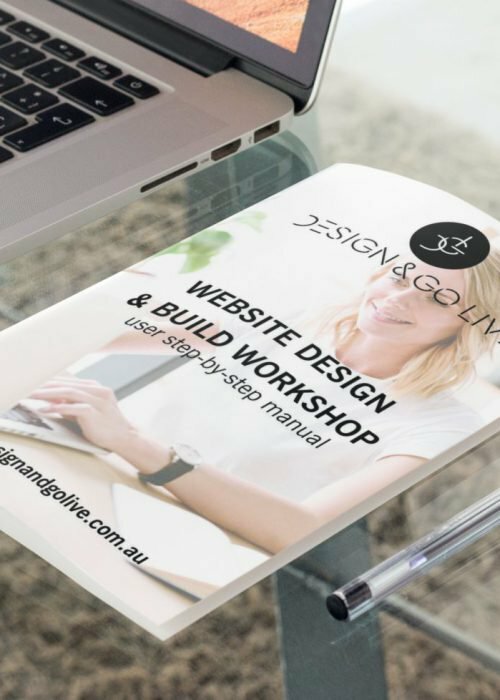 We have covered all areas that are required to design a website over the two days, and moving forward you will have the skills to maintain your website…potentially saving you thousands of dollars. We want you to have the most fulfilling, stress free and result driven experience and have you leaving with a wealth of information and the skills to move your website forward as your business grows. All students are given a beautiful 50 page ‘Set-by-Step’ manual to take home for future reference. This little gem includes screen shots and instructions of everything we cover over the two days. It also has a huge list of free resources & tips to help with website engagement and growth. We want you to focus 100% on taking your brand online so we have taken care of all your meals over the two days. All meals. tea, coffee and juice are included throughout the two days, and we’re not talking sandwiches or wraps…. It’s more than a workshop. It’s an experience with a great outcome. Most students stay and take the opportunity to have a little break while still achieving their goal of planning and designing their website. It’s also the perfect way to connect with like minded business owners. Simply getting away from the workplace can do one a world of good. Taking time for you is not a luxury, it’s a necessity to your well-being and mental health. *photo courtesy from our Fleurieu Peninsula workshop. Please ask us about accommodation as all students receive a discount.